Paperback, used good. Ordered from BWB for birthday group (eponine38). Thank you, Lamilla, for this wishlist book! I've wanted to read it for some time now, especially as the Alcotts were a local family. My frame of mind when starting to read this book several months ago made the going quite tough, and I almost abandoned it. Now I’m glad I stuck with it, because either the book or my mind/life improved (or both!) and I found it fascinating. Even having lived all my life near Concord and visiting two or three times a year, I found much to learn from this detailed book. Bronson was quite a character. I don’t agree with everything he did, especially when he seemed to indulge his own literary and philosophical longings at the expense of his family. 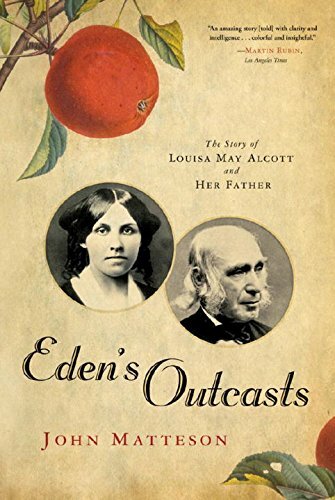 Matteson writes, “More often than not, Bronson Alcott tended to live more in his ideas than in his skin.” For Bronson to expect his family and the few other participants in the Fruitlands experiment to be what we would now call vegan, was both selfish and unhealthy. But idealists almost always mean well. It’s interesting to ponder the current idea that both Bronson and Louisa likely suffered from bipolar disorder - definitely seems to explain a lot. Poor Louisa also had serious physical problems due to her treatment with calomel (a mercury compound) for the typhoid pneumonia she contracted while working as a volunteer nurse during the Civil War. I was impressed with Abba’s strength and patience as wife and mother and want to learn more about her. It would be interesting to read Marmee & Louisa and compare Louisa’s relationship with her mother to the one with her father covered in this book. I also enjoyed learning about Louisa’s real-life sisters, and never knew that following sister May’s death, Louisa raised her niece and namesake (Louisa May “Lulu” Nieriker) for several years until her own untimely demise. In short, this is a book that is worth several readings – it’s that packed with details of this fascinating family. FINALLY...on its way to elizardbreath as a very belated 2018 birthday gift. I think I promised it to you by the end of February, so I apologize for it being extra belatedly belated. Hope you find it worth the wait! Released for 2019 Keep Them Moving Challenge hosted by booklady331. Fantastic!! Thank you so so much for sending this my way. I'm looking forward to reading it and will then pass it on to my mom who loves anything having to do with Louisa May Alcott. Thanks, also, for the "authors of Concord" postcard. That's even more of a treasure to me than this wishlist book. My only US dream vacation is to go visit the authors' homes and stomping grounds in the Concord area. It's definitely gonna happen sooner rather than later!